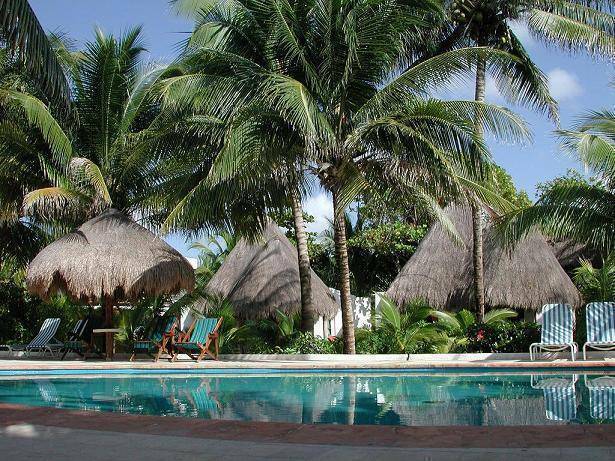 Hotel Las Palapas, located of one of the most beautiful white-sandy beaches with crystal-clear turquoise waters, at Playa del Carmen, features 75 one- and two-story rustic, thatched cottages tucked amongst palm trees, in lush, tropical gardens. The laid-back atmosphere can be enjoyed on hammocks on each cabins porch or balcony. The rooms are equipped with 2 queen sized beds in a pleasant, simple style. 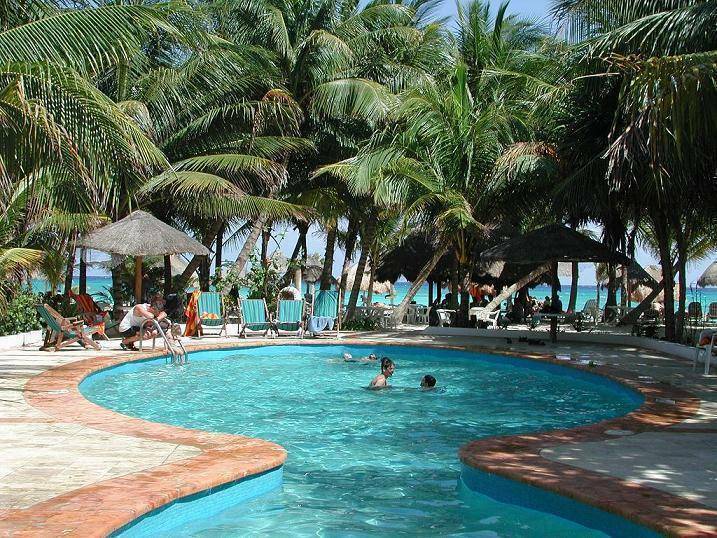 Las Palapas offers two restaurants, beach bar, club house, swimming pool, wellness /spa center, and many other amenities. This is the perfect place to get away from it all. 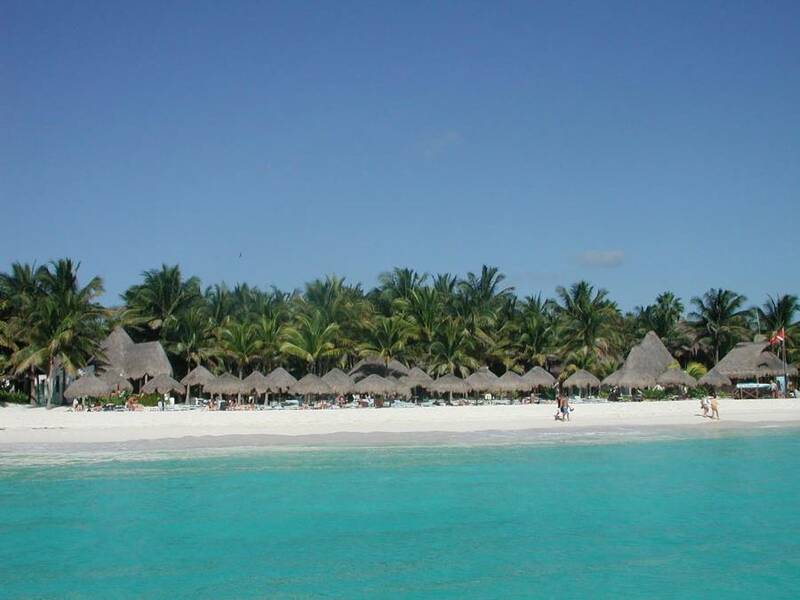 Las Palapas is SIMPLY PARADISE! 75 rooms (7 Beachfront, 48 Standard and 20 Garden Deluxe) in one or two-story bungalows ("cabañas"). All equipped with 2 queen size beds, ceiling fan, bathroom with shower and hair dryer, safe box, telephone service, and a private veranda or balcony with hammocks and armchairs. The Garden Deluxe rooms have an additional sitting area with a sofa-bed. Our rooms are surrounded by ample and exuberant tropical gardens. Most rooms are air conditioned. Mini-bars are available on request. The voltage of our electrical outlets is 110 volts. Fully oriented towards protection of the natural environment. Over 50% of the grounds have been basically left untouched. Changing of bed linens and towels is done according to each guest's preferences. Water and energy saving practices and biological degradation of organic waste are hotel policies. All major credit cards are accepted: Visa, Master Card and American Express. Phone, fax and internet service at the Front Desk. Baby cribs and additional beds available. Reservation of tours; car and bicycle rentals, and 18-hole golf course (approx. 1 mile from the hotel) can be booked at the Front Desk. Complimentary Welcome Drinks served weekly. Foreign currencies exchange (in small amounts) available at the Front Desk. Baby-sitting service can be hired through the Front Desk. BEACHFRONT 7 beachfront bungalows with thatched roofs, situated directly on the white sand beach. Equipped with 2 queen size beds, ceiling fan, bathroom with shower and private terrace with hammocks and armchairs. No air conditioning available in beachfront rooms. STANDARD 48 standard rooms in one or two story bungalows, all with lovely views of our garden. The hotel rooms in the one story bungalows and the upper rooms of the two story buildings have thatched roofs. Equipment and size of the standard rooms are equivalent to the beachfront rooms. Many of the standard rooms have air conditioning. GARDEN DE LUXE 20 garden deluxe rooms in one or two story bungalows, located in a natural tropical environment in the back part of the hotel. These rooms have an additional sitting area with sofa bed and are considerably larger than the beachfront and standard rooms. The rooms in the one story bungalows and the upper rooms of the two story buildings have thatched roofs. Many of the garden deluxe rooms have air conditioning. 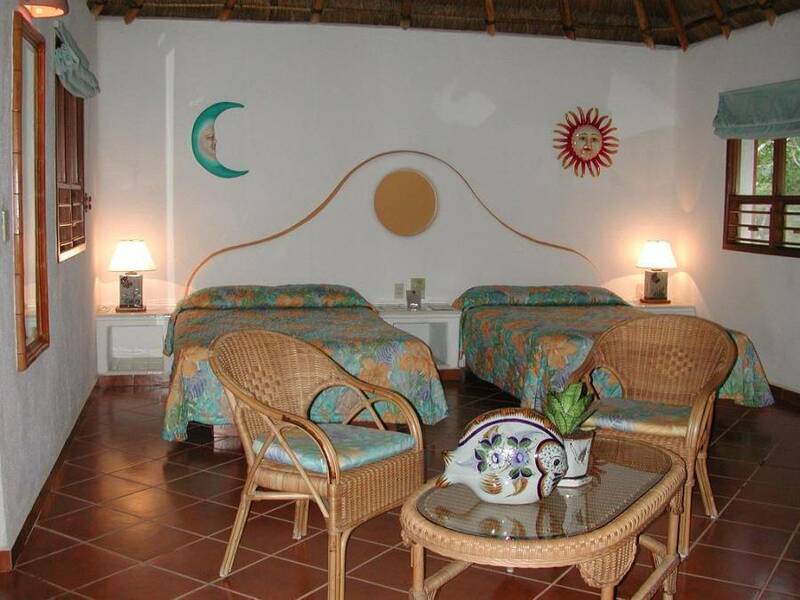 Conveniently located about 1/2 mile (1 kilometers) from the center of Playa del Carmen, Hotel Las Palapas represents the best of both worlds - the excitement of Playa del Carmen and the beauty and serenity of its beaches. Archeological sites like Tulum, Coba and Chichen Itza Mayan ruins can easily be reached from the hotel, as well as the nature parks Xcaret, Xel-Ha and Tres Rios. Also, there is a regular ferry service from Playa del Carmen to Cozumel Island. In our main restaurant you start your day with a rich breakfast from our buffet. Dinner is a four course meal with a selection of two to three Mexican or International dishes. Lunch is served in our Casa Club (the Club House). On the menu there are delicious international and Mexican dishes and snacks, and the little ones can choose from their own kid's menu. Our beach bar is the place where people meet during the day to enjoy a drink under the swaying palm trees. Order your favorite drink, or let our staff surprise you with their creations! From / To airport: Most Tour Operators include it in their packages. There is a taxi service at an approximate cost of US $75 airport-hotel and US $40 hotel-airport (up to 3 persons per taxi), and also a bus service that runs from the airport to Playa del Carmen at an approximate cost of US $6 per person. There is a bus station in Playa del Carmen, where buses depart to most destinations throughout the Yucatan Peninsula. Local taxi service can be requested at the Front Desk. Information and contacts for various car rental companies is available at the Front Desk.